Imagine a distant future in which all that is left of British culture is a copy of The Daily Mail from 19 April 2014. Or, if you prefer, imagine yourself a traveller to Britain who comes to the country armed only with the aforementioned newspaper as a guide. By a fortuitous coincidence, I happen to own a copy of the very issue in question. What kind of object is this? At over a hundred pages thickly covered in small type, it packs a great deal of reading material. 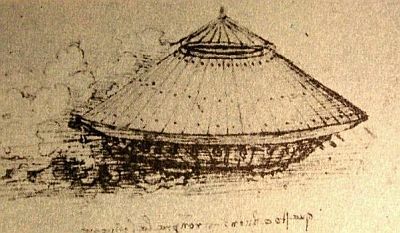 If one were to approach it with the mindset of a future archaeologist, enough to make several inferences about the customs, habits and culture of these by-now ancient people. Ruled by a benevolent Princess with a keen interest in footwear, the Britons were a tightly knit people who loved in a series of villages with names like Cheltenham, Richmond and Teddington, and who appeared to care very deeply for each other's business. Intensely tribal and distrustful of foreigners, the Britons kept mostly to themselves, save for sharing in the occasional amusing, quirky story from faraway lands. But their prevailing sentiment was a generic, all-purpose fearfulness, mixed with concern that they might be getting a bad deal from health authorities or the local supermarket. 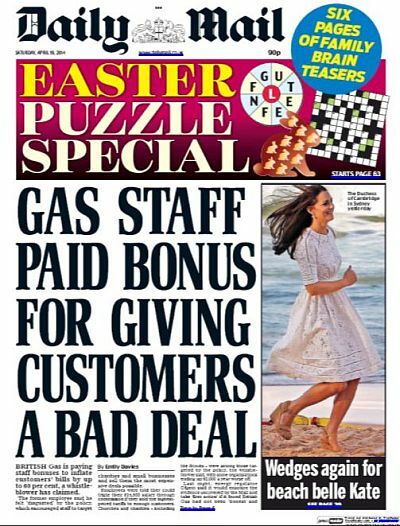 18 April 2014 was a slow-news day, at least as measured by the contents of the Daily Mail that came out the next day. The issue is decidedly ho-hum, at least by the publication’s renowned standards. ‘Swarming migrants’ barely rate a mention, and its most lurid tales concern dead celebrities as opposed to active politicians. But it’s a more instructive read that way, without the distraction of overtly fascistic performances. It’s easier to focus on what the bulk of the newspaper is really about, and how it goes about constructing its reader/subject. Firstly, my Daily Mail has no clear logic or structure. 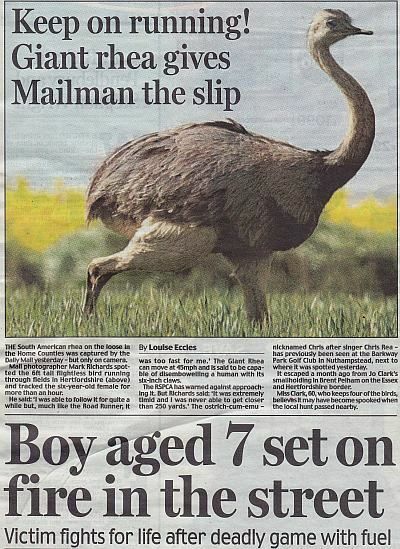 Outside of the business section and the sports section, it consists of a stream of news items in no particular order of salience or gravitas, jumping cheerfully from a mailman being chased by an exotic bird to a child of 7 being set fire to in the street. to an account of William and Kate’s fighting back tears after chatting with the parents of a nine month old boy about to die of meningitis. In a similar vein, several of the articles contradict their own claims. 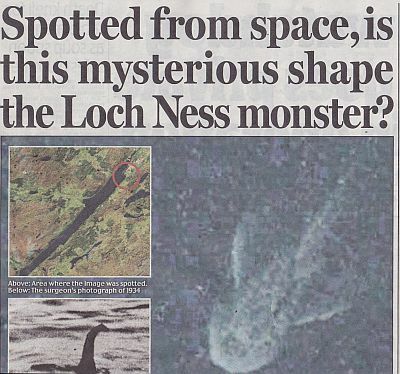 Take this startling piece on a possible sighting of the Loch Ness Monster via an image from Google Maps. The general effect is that of a newspaper written for squirrels, or other similarly nervous woodland creatures: always leaping from page to page, always on guard, never sure if the next turn will bring comfort or danger. One moment you read about the crisis in Crimea (‘It’s time to grab Putin by the roubles’, declares an editorial), the next you are warned alliteratively about a salmonella scare in bags of sultanas sold at Sainsbury. 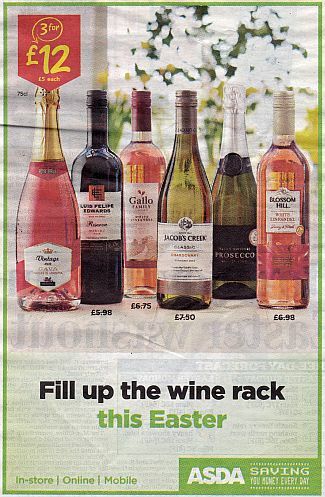 No sooner you have digested the tale of the teenage nephew of a British Guantanamo inmate shot dead fighting jihad in Syria, that you learn that a bottle of wine a day ‘is not bad for you’ according to ‘leading scientists’. 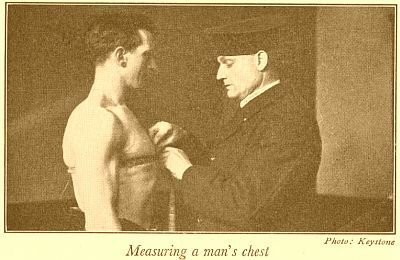 It seems that on 19 April 2014 the Daily Mail gave immigrants a break so it could concentrate on bashing the NHS, with no fewer than three stories sounding the alarm on its culture and practices, and an editorial calling for an urgent debate ‘on whether a monolithic and increasingly uncompassionate system, run entirely by the State, is the most efficient means of delivering this country’s ever more complex healthcare needs.’ But leaving the conservative politics to one side, the NHS stories also fit within the newspaper’s borderline obsessive focus on consumer affairs. From the public health service to the bags of sultanas that could give you the shits; through dubious practices at British Gas, bank and insurance terms and conditions ‘longer than Macbeth’, the world’s airport attendants rifling through 22 millions items of luggage every day, and a council in Wales that plans to introduce a three-weekly bin collection, the Daily Mail reader is kept in a perpetual state of anxious vigilance over the workings of all service providers, public or private. Then there are, of course, the always instructive stories about the petty legal troubles of the have-nots, which feed directly into that running sense of grievance. There is the ‘benefit cheat’ mother of six who was spared jail and is now escaping community service because she ‘claims to be too sick to do it’ (never mind that a court accepted evidence as to her state of health), and the woman who faked her own death to get out of a £39 fraud charge, to which the paper is willing to extend the courtesy of blurring the face of her child. From there we move to the issue of CCTV cameras being installed on private properties but used to spy on others, leading to what is quite possibly the least self-aware headline in Daily Mail history. The Daily Mail paints a picture of life not in a modern, confident, outward-looking nation, but in a vast, bloated village. Its readers aren’t citizens. They’re not consumers, either. They resemble rather a roving neighbourhood watch, armed with a very long list of things and people which fit the definition of suspicious. I should say something about the advertising, too, which suggests that the readers of the Daily Mail are quite old, as evidenced by full pages devoted to chairlifts, riser recliners, walk-in baths, or a circulation booster called Happy Legs. But I take no comfort in this: the thing about old people is that they always get replaced, and besides the problem aren’t old people but old ideas. What the Daily Mail presents us with, even or perhaps most especially on a slow-news day, is the concrete expression of an ideology. Occasionally, some of the tenets of this ideology are blurted out explicitly (for instance: ‘It’s families that create self-reliant, aspirational, decent citizens – not politicians.’) But mostly it is articulated in the form of stories that reflect a world view, and contribute to viewing the world in a very particular light. As an intellectual project, it is remarkably coherent and consistent. It is also very powerful, in that it emerges from a collection of facts, or things that look like facts. Sometimes you feel like you can almost make out an overall shape. But then you realise it’s only a shadow, or the underwater currents the loch. This review was first published at Overland. I am a man of simple pleasures. 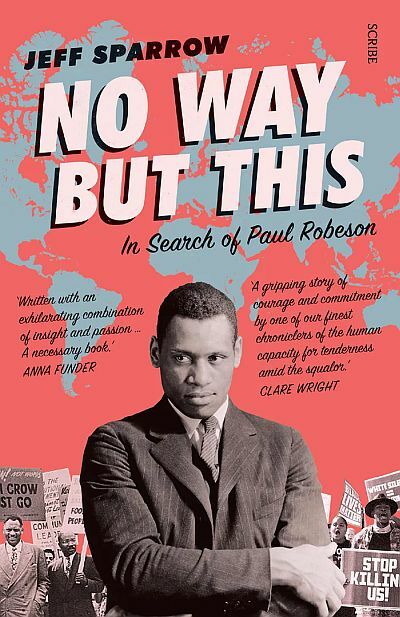 And one of these pleasures is to receive emails from AbeBooks informing me that somewhere in the world they have found a book I have been looking for. I have a few pending requests. 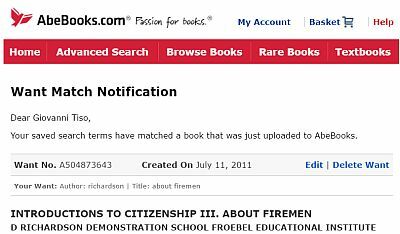 I like that the website keeps track of how long I (or rather, they) have been looking for each book. This one was nearly six years coming. I can now ‘delete my want’. children, even quite young children, can and should make contact with some of the essential social services in the community. The books were written with the school in mind, and link to one of the my favourite recurring topics: the historical representation of work, especially for pedagogical purposes. 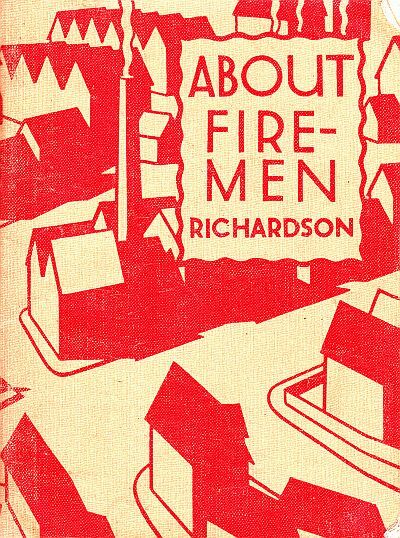 However, Richardson’s choice of four at the time all-male professions suggests that for them talking about labour ultimately meant upholding a specific ideal of society: namely, one that is orderly (policemen), clean (dustmen), connected (postmen), and safe (firemen). These for the author are the underpinnings not just of any society, but more specifically of democratic ones, in those days of ‘social, political and international unrest’. 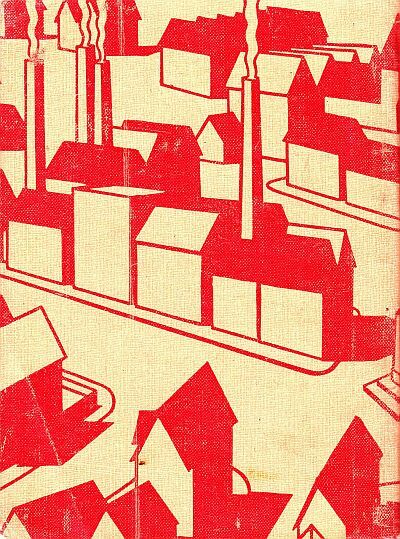 Consider About Firemen, then, like the other little books in the series, a treatise on life during a sort of permanent peacetime home front, while fascism raged abroad. Richardson’s firemen are well-trained, diligent, brave and strong. They wait at the station for the next alarm, either maintaining their equipment or resting or sleeping in their bunks, unless they are first in line to respond to a call. 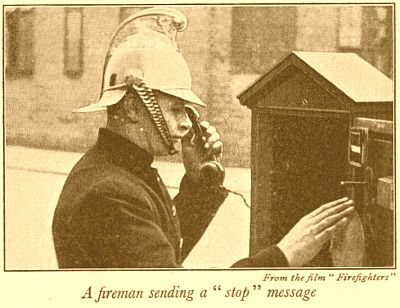 Outside the station is London, with its networks of fire alarms and hydrants, and its symbols for the initiated. Enamelled tags attached to buildings whether a hydrant (H) or double hydrant (HD) is situated directly underneath (diamond-shaped tag) or on the opposite side of the road (oval shaped-tag), while special boxes allow people to send an alarm signal to the station or firemen to communicate that the situation is under control and no more appliances are needed at the scene. 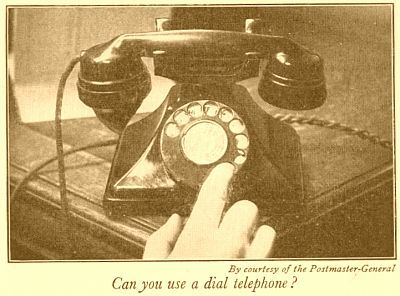 Other ways to contact the service include special button in police boxes, or personal communication devices that have started to appear in the wealthiest homes. 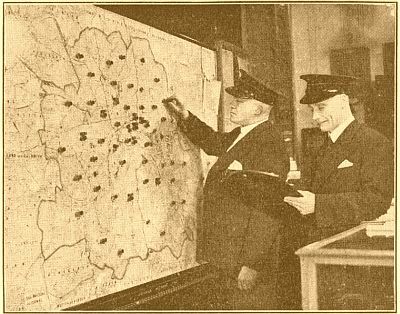 Back at central station, the commanders track in real time the deployment of appliances on a map of the city. 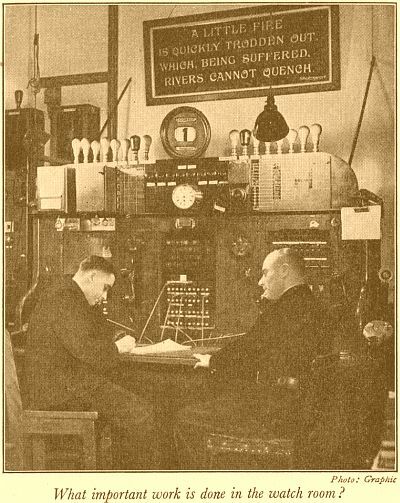 While other officers operate the switchboard and map out the calls. Overseen by a military chain of command, this is a model of the city as an organism, a body to be disciplined and protected. 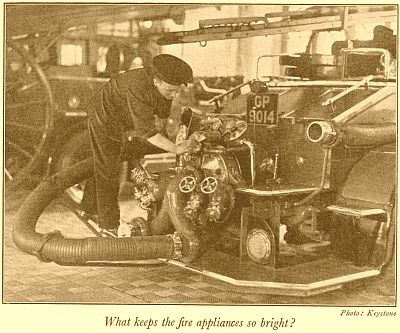 The job of the fireman, which in reality must require a great deal of resourcefulness and creativity, is reduced therefore to a series of component functions, or conditioned, automatic responses, to be carried out with efficiency and precision. A strange lesson to teach in the pursuit of civics education, perhaps, if the ulterior motive is say things about the nature of citizenship in a free society. I enjoy these books. 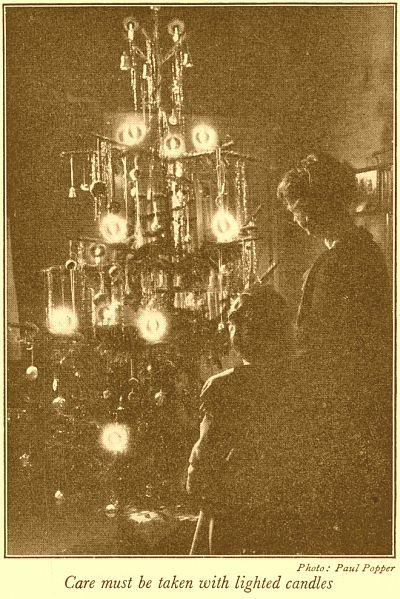 They have a quaintness about it, such as when they admonish against leaving candles on the Christmas tree unattended. I’m old enough to remember Christmas decorations requiring actual flames. 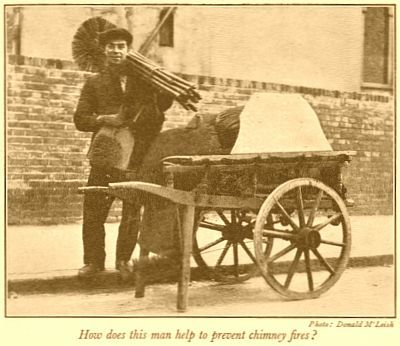 I enjoy finding out in the 1930s in Britain fire brigade call-outs were free unless it was for a flue fire, in which case you were regarded as being neglectful and had to pay. 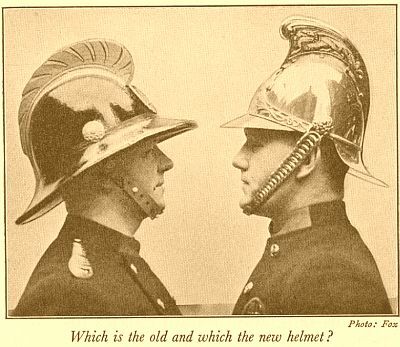 I enjoy reading about the transition from the classic brass helmets – which as well as being very heavy had become an electrocution hazard since the introduction of electricity to the modern home – to new ones made of cork and rubber. But mostly I like them for these books for the usual reason: that fewer attempts are made nowadays to teach people about work, or about how things are made and by whom, and it’s a topic I’ll never cease to find interesting, just as I did when I was the age of D. Richardson’s intended reader. Now, I’m still missing About Policemen and affiliated second-hand booksellers are aware but still, if you should come across it please let me know. D. Richardson. About Firemen. London: Ginn and Company, 193? When my grandmother developed Alzheimer’s disease, she started to get me confused with her son, who had moved to Brazil at what was then my age. As a result of this, and of the feelings of guilt she still harboured towards him, seeing me had the effect of making her anxious. It was only through conversation that she became calmer to the point where we could enjoy each other’s company. Eventually I learned that the best course of action was not to correct her misapprehension, but rather to speak with my own voice and to tell her ordinary things about my life. I neither indulged nor rebelled against her fantasies. I let her talk about my grandfather as if he were still alive, and brought the conversation back to shared memories or concrete topics she could still grasp and express an opinion about. The success of this strategy was limited, but one day our conversation went so well I forgot about her illness, or even to keep an eye on the time. The visit ended with my having to literally run across the village to the railway station in order to catch the last train back to the city. My grandmother’s daily self-care needs were very high, and it never occurred to us at the time that her rigidly segregated, hospital-like rest home might not be the best place for her to wait safely, and in relative comfort, for the end. 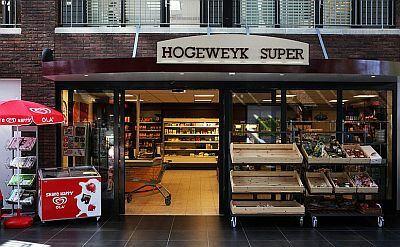 In those same years, a group of Dutch caregivers began designing Hogeweyk, a village conceived to allow dementia sufferers to maintain a measure of autonomy and control over their environment. Structured around a series of template ‘lifestyles’ – ‘upper-class, homey, Christian, artisan, Indonesian and cultural’ – the group homes at Hogeweyk don’t confront residents with constant, jarring reminders of their illness, but rather encourage social interaction and participation. Other facilities that have been built since then, such as the Fartown village at Huddersfield in the UK, are modelled around 1950s housing and communal spaces, with meticulous attention to period detail. What in other contexts may strike us as superficial, fashion-driven nostalgia, here serves the pragmatic purpose of keeping residents anchored to their psychological present – that is, to the time to which what is left of their memory most frequently returns. Residents of these facilities can go shopping (using fake money) in stores lined with generic, familiar products. They can walk the streets of the small grid-like quarters in safety, under the watchful eyes of cameras and plain-clothes nursing and security staff. At the Benrath Senior Centre in Düsseldorf, they can even wait at the stop for a bus that will never come. The concept is highly suggestive, and routinely evokes comparisons to The Truman Show, Andrew Niccol’s sardonically dystopian story of a man condemned to live his life on a television set. In this case, the pretence is humane, as it seeks to restore (as opposed to suppress) agency, but the broader cultural reverberations are hard to ignore. Increases in life expectancy have caused dementia to reach epidemic levels, and many – if not most – families in the West are set to be affected by it as populations continue to age. But its effects are markedly different: for the sufferers, it sometimes takes the form of a long, almost gentle goodbye, the gradual taking of leave from the experiences and the relationships of a lifetime; for their loved ones, it is both heartbreaking and a burden. The duty to care for someone who can no longer recognise us, and increasingly be recognised by us for the person we once knew, is a heavy one. It can also be terribly hard to let go, to accept that the objective facts of our lives cease to matter when measured against the pain and disorientation that reminding can cause. For the families, then, it becomes an exercise in wilful amnesia: we learn to allow our elders to forget. 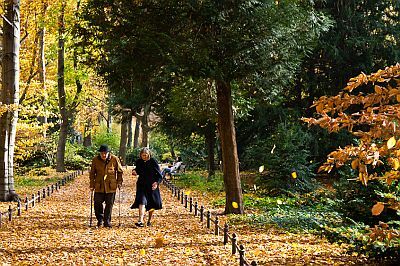 At the same time as individual lives are getting longer, exposing more people to dementia, our collective life as a species is getting shorter. It is the same progress that presides over both the medical advances and the frantic exploitation of the planet’s resources for present-day use, which threatens to erase the future altogether. Soon there may no longer be a past for anyone to remember, and ‘dementia villages’ like Hogeweyk will become indistinguishable from every other built environment. For now, however, their import is much more symbolic. Like my conversations with my grandmother, these special facilities make concessions to forgetting that our culture is generally unwilling to make so that what is left of experience can be salvaged and shared. They show us that memory can be a burden, too, and how to alleviate it. Run 5 minutes a day: 5 years. Exercise when you’re old: 5 years. Eat oily fish twice a day: 2 years. 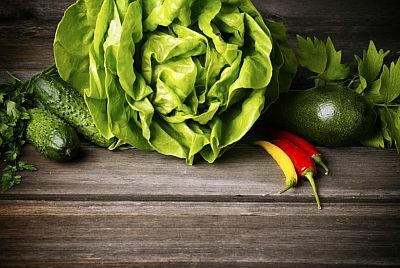 Follow the Mediterranean Diet: 15 years. Be right handed: 10 years. Move from Zutphen to Crete: 6 years. Take this longevity pill for dogs: 4 years, equal to 28 human years. Be a Tour de France cyclist: 6 years. Have grandchildren, care for them: 5 years. Cut down on calories: 18 years. Win the Nobel Prize: 2 years. Win an Oscar: 4 years. Win an Olympic medal: 2.8 years. Run some more: 3 years. Do these four things: 14 years. Walk this way: 5 years. Play this game: 10 years. Move to a democratic country: 11 years. Be a well-educated person: 7 years. Get castrated (if a man): 13.6 years. Do housework (if a woman): 3 years. Become a cloistered nun (also if a woman presumably): 9 years. Do regular exercise: 4.5 years. Become an Adventist: 5 years. Become a vegetarian: 9 years. Go to university: 7 years. Get more friends: 7 years. Take at least 300 milligrams of vitamin C per day: 6 years. Be a smoker, then quit when you’re middle aged: 10 years. Be Italian or Spanish, rather than English: 2 years. Stop looking at your phone: 11 years. Kiss your spouse in the morning: 5 years. Use a standing desk: 2 years. Drink a glass of wine after work: 5 years. Achieve frequent orgasms: 2 years. Eat nuts 5 days a week: 3 years. Socialise with baboons: 2.5 years. Bonus tip: since each hour spent running adds 7 hours to your life, achieve immortality by running for 3.4 hours a day. Or you could try volunteering, which reduces by 20% your chance of death (the standard human rate being 100%).